The new Hotel ZaZa— Houston is a historic, 12-story, 317 room hotel built in 1925 in Houston’s Museum District. Beginning in the fall of 2005, the hotel began a complete renovation, including plumbing infrastructure, pipe restoration, reopening in 2006. TDT recommended Hotel ZaZa utilize in-place pipe restoration using the ACE DuraFlo ® epoxy coating system to solve their plumbing challenges. The epoxy coating solution solved the hotel’s leaks, returned maximum flow to the system, and extended the system’s usable life. Additionally, Hotel ZaZa also capitalized on the best solution available to address the project’s environmental concerns, nearly eliminating the need for asbestos abatement leading to project savings exceeding $40,000. 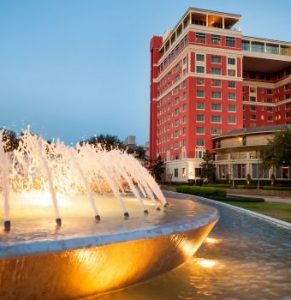 When Hotel ZaZa purchased The Warwick Hotel in 2005, all 34 of the hotel’s 80+ year-old galvanized hot and cold risers had failed and required replacement or restoration. The pipes were suffering from restricted flow, rust-colored water and pinhole leaks due to extensive corrosion throughout the system. Additionally, environmental hazards were present in the form of asbestos insulation encasing many pipes in the plumbing system. Description: Hotel ZaZa’s 80+ year-old galvanized hot and cold risers had failed and required replacement or restoration. TDT utilized ACE DuraFlo ® epoxy coating in-place pipe restoration system to solve the hotel’s plumbing challenges. ePIPE is a proven pipe relining, pipe restoration system to save building owners and homeowners thousands of dollars, while also saving occupants the messy, noisy and destructive experience of a conventional repipe. The dried pipes are cleaned using an air and abrasive mixture that prepares the inside surface of the pipes for proper bonding of the epoxy. An air and corundum mixture is used to sandblast the inside of the leaky or corroded pipes. The final stage of the ePIPE pipe restoration and corroded pipe repair process is the application of the copper pipe epoxy coating lining to the system.